Are you living your dream life? If so, kudos to you. How many of us actually have the courage to pursue our dreams? I'll admit I love where I am in life. I made a bold decision to move from Indiana to Arizona for a job over a year ago and I've never regretted it. I found a deeply rooted love for the outdoors and an appreciation for the desert's unconventional beauty. But my dream life? To work remotely and travel the world. I've read articles about people who have done it. I've watched Facebook videos. Featuring people who moved thousands of miles away from friends and family to live a more exotic life. Couples that spend years traveling the world to gain an experience of a lifetime. It always seemed like a far away concept. Something one can only dream of doing. Until I became an Airbnb host. Bea and Helmut's hometown of Burghausen. And I actually met these temporary nomads who had the courage and determination to make their wanderlust a reality. I recently hosted Bettina (Bea) and Helmut, two Germans traveling the world on their motorcycles. They stayed with me to catch up on freelance work and to update content on their site, Time to Ride, where they document their travels and share how they make this lifestyle possible. Originally from Burghausen, Germany, Bea and Helmut—an environmental engineer and mechanical engineer respectively—quit their jobs five years ago and have been traveling the world ever since. They rode their 20-year-old Hondas all over Europe and Asia, and then through New Zealand and Australia, where they were doted on by a couple of empty nesters. They spent time in Cuba and Jamaica and became honorary members of a South American family in Bogota before riding up through Mexico and Arizona. As if I wasn't green enough with envy, Helmut is a wonderful photographer and showed me their prize for winning first at the Overland West Photography Expo near Flagstaff, Arizona. They were gifted with an aluminum print of their photograph "Million Star Hotel", which captured their illuminated campsite beneath a star-studded Bolivian sky. I don't think my inner aspiring photographer could have yearned for anything more. I loved getting to know Bea and Helmut. Not only were they courteous guests (I think Bea cleaned my kitchen more than I do), but were also as entertaining as they are interesting. Helmut with his dry, sarcastic sense of humor and Bea with her easy laugh and embarrassment at Helmut's jokes—most of which involved them hightailing it out of Phoenix after Bea's cooking accidentally burned my apartment down and using my return address to ship alcohol and cocaine to Germany. Helmut also imparted many words of (sarcastic) wisdom during his stay, which I now regret not taking more detailed note of. One of my favorite things about hosting them was the meals we shared. One night, I made them meatloaf with mashed potatoes and corn on the cob. Their excitement to try an American dish was infectious and it was interesting to hear how it differed from the German equivalent, hackbraten. They shared with me a typical German dinner of creamed minced meat and sauerkraut. 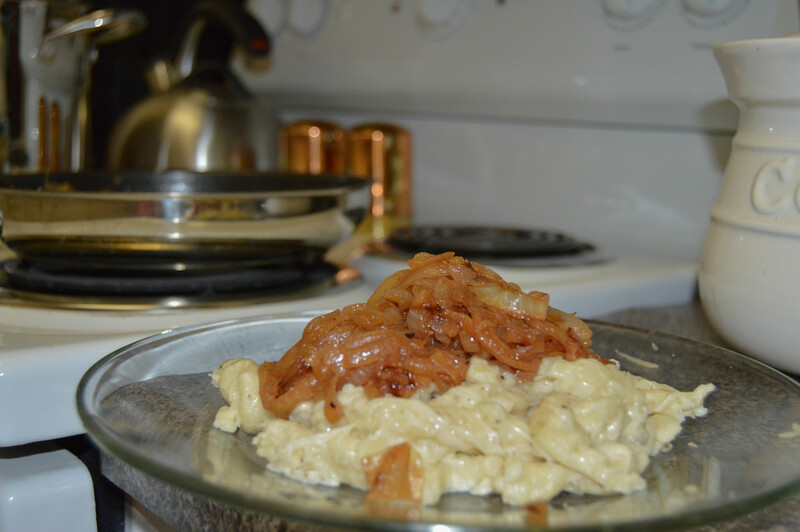 They also showed me how to make spätzle, a Bavarian dish of Swiss cheese-covered dumplings topped with sautéed onions. 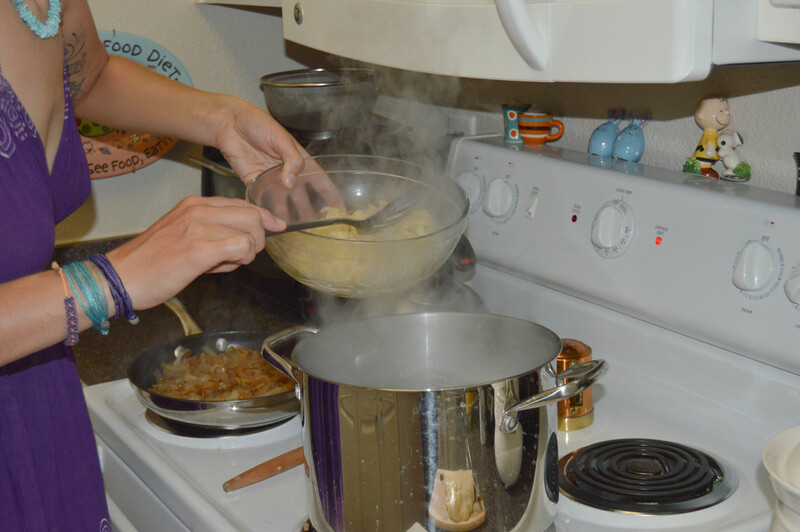 It entailed a tedious process of thinly slicing dough and dumping it into boiling water, spooning the cooked dumplings out, and repeating the process until the entire batch of dough was gone. After that, it was just a matter of adding Swiss cheese to the dumplings and topping it with onions. I also enjoyed our nightly patio discussions over beer and wine, during which they shared stories of people they met on their journey. What I found most interesting were the nuances they noticed between cultures. How everything in America—from housing lots to ground beef chubs—is larger. How Australians don't mingle with many friends because they're constantly moving about the continent. How it's not uncommon for a 75-year-old Jamaican man to have 10 children with five different women over a span of 45 years. I'm excited to follow Bea and Helmut on their travels and see what they experience next. They plan to ride the National Park loop through Arizona and Utah, then over to Vegas and up California. They will then ride through the Pacific Northwest and spend some time in Canada before making their way across Alaska. Then it's back home to Bavaria, where they mentioned becoming Airbnb hosts themselves. I wish Bea and Helmut the best of luck in their travels. They have many beautiful trips ahead of them and I hope that the people they meet along the way are as inspired by them as I am.